I previously spent one year using Headspace meditation app every day. Once the year was over, I wrote an app review called “Headspace Meditation App Review (One Year of Daily Use)”. Very few critics spend a whole year testing a product, so I felt like I could give a more comprehensive review than most other writers. Once my Headspace subscription was over, I switched to Calm, one of its main mindfulness app competitors. Once again, I decided to spend a whole year using the product before I’d write my review. 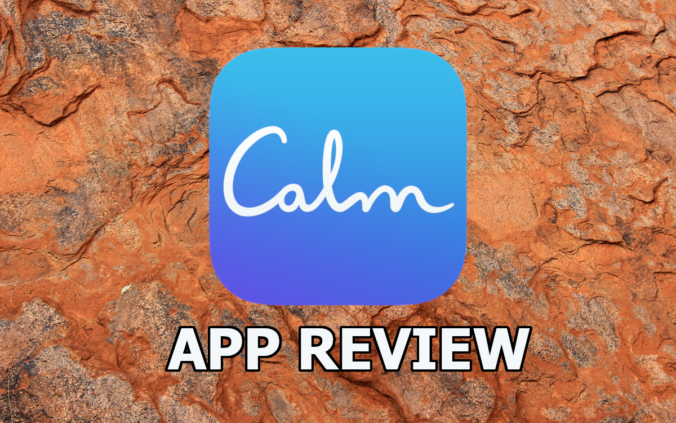 Now that year has passed, and it’s time to share my verdict on this Calm app review. The price of Calm varies by time and region. 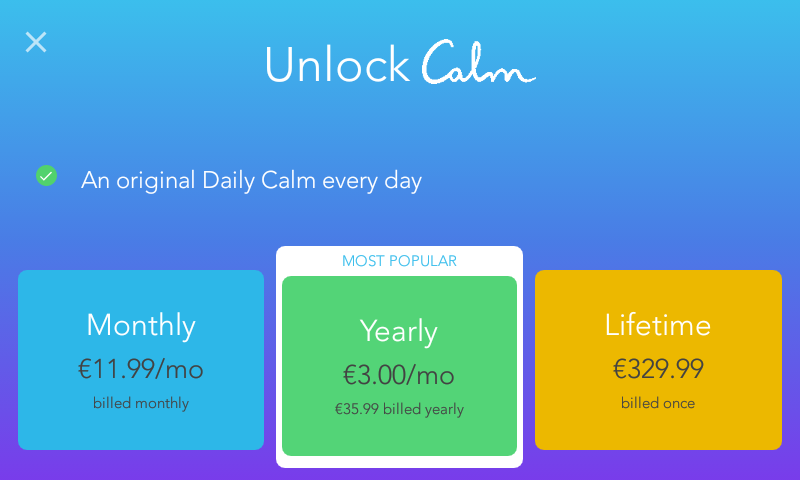 As of April 2019, Calm offered a 7-day free trial and an annual subscription cost 36 euros. Let’s start this Calm app review with the introductions. Calm was launched in 2012, and it has grown into one of the most popular and profitable mindfulness and meditation apps out there. According to the company, Calm now has over one million paid subscribers. Meditation in Calm comes in several forms. First, there’s Daily Calm, a 10-minute daily session that mixes simple meditation with short stories on changing topics. Then there are several longer courses that take either 7 or 21 days to finish and single meditations of various lengths. 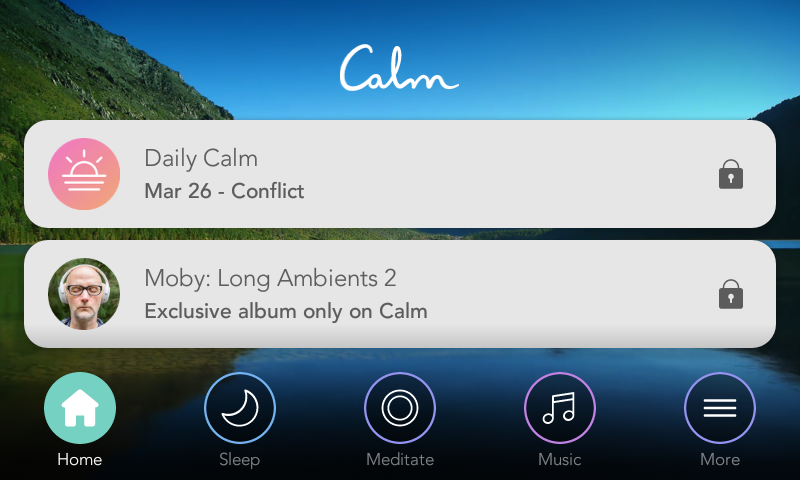 What’s striking about Calm is its wide range of features. Instead of of focusing on just meditation, Calm has several different sections that are more or less connected to mindfulness. There’s a music library for different moods, Calm Masterclass for mindfulness lessons, Calm Body audio guides for stretching, and so on. Besides meditation, Calm’s second major focus is sleep. Calm offers sleep stories, sleep music, sleep sounds and sleep meditation for those who want to, well, fall asleep better. While I never got into the habit of listening to the sleep stories, I did use the guided meditation sessions for sleep on several occasions. Calm offers several different features for different purposes. There’s even a section called Calm Kids for children. What Is It Like to Meditate with Calm? After a year of using Headspace for meditation, it took me some time to adapt to Calm. When I used Headspace, I really enjoyed its 10 and 30 day meditation courses. They were well-guided, practical and also gave lots of great advice and tasks for daily life. In comparison, the courses of Calm feel more shallow. The courses are shorter, and although they introduce many core concepts of mindfulness, they never seem to delve very deep into the topics. The Calm meditation courses mention many good ideas, but I would have preferred it if the app had requested the user to do more things outside the meditation sessions. However, the meditation courses are just a side dish in Calm mindfulness app. The main meditation feature is Daily Calm, a short meditation session that changes every day. The Daily Calm sessions are simple and straightforward, but the short discussions on changing topics bring variety to the sessions. The presenter of the meditation sessions, Tamara Levitt, does a good job as the voice of Calm. As she shares some personal anecdotes during the Daily Calm sessions, the user feels a kind of a personal connection with her. She sounds friendly and sincere and manages to bring more personality to an app that can feel quite impersonal at times. I seriously wonder if navigation within Calm has been made difficult by purpose. The newest updates have increased the size of the course icons, making the exploration even more cumbersome than before. Although the Daily Calm is clearly the focus here, my favourite meditation sessions in Calm are hidden deep inside the (very disorienting) menu. Even though you have to struggle to find them yourself, Calm offers great single meditation sessions with several session durations to choose from. For example, I really enjoyed the Loving-Kindness meditation sessions where I could set the duration between 3 and 25 minutes. It’s just a shame that navigating the meditation section to find what you’re looking for is a real pain. 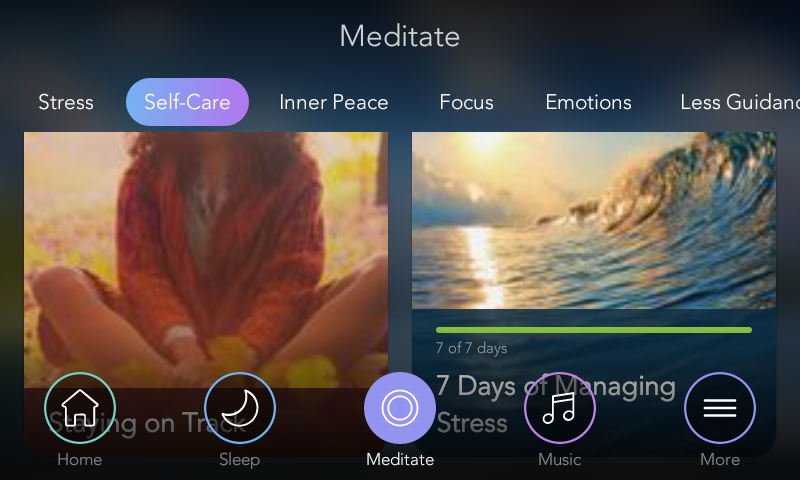 Instead of a pure meditation app, Calm is more like a hub for varied mindfulness-based content. Let’s continue this Calm app review with a deeper look at the other features. First, there are the Sleep Stories. Besides Daily Calm, Sleep Stories seem to be the other main focus of Calm. The company has hired actors and celebrities such as Stephen Fry and Matthew McConaughey to read some of the stories. Sleep Stories are like bedtime stories for adults, and they can include anything from nonfiction to novel excerpts. I listened to the stories a few times, but I soon quit as I felt like I had no use for them. Still, it’s possible that they might help someone else. I didn’t care about the Sleep Stories, but I did enjoy the instrumental music section for a while. The tracks are mainly non-intrusive, so they can work as good background music for working or relaxing. I used the tracks to cover my tinnitus while working until I got tired of the limited catalogue. 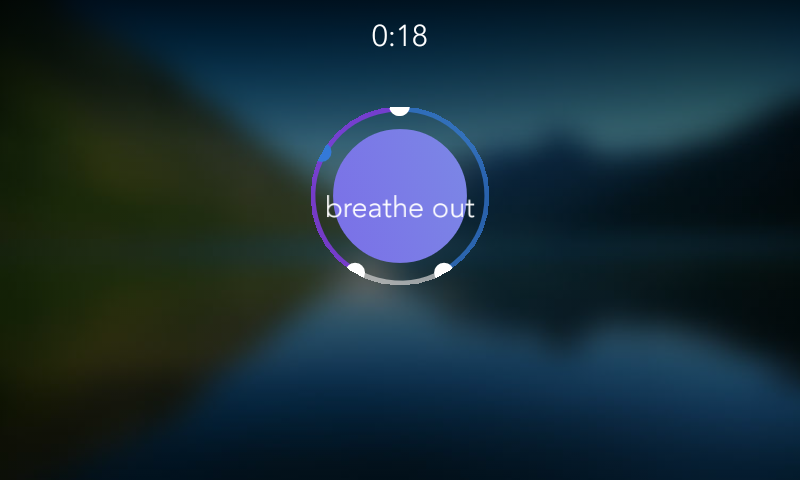 Breathe Bubble, one of the simplest features of Calm. 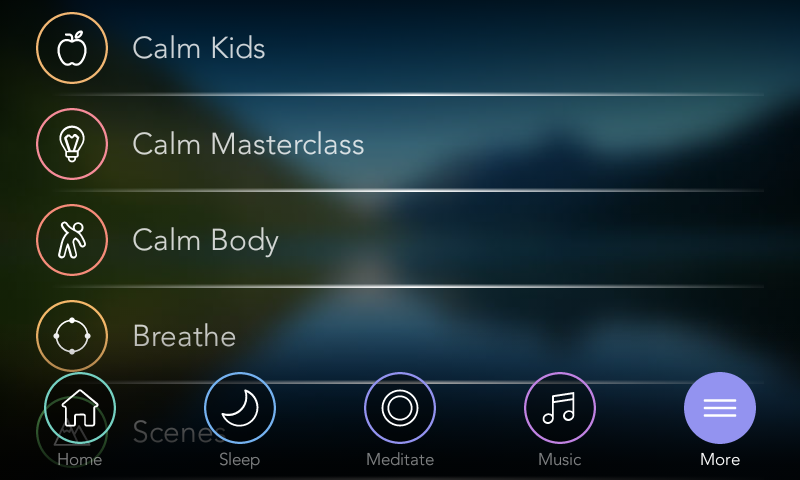 In 2018, Calm added features called Calm Masterclass and Calm Body. Calm Body was released in late 2018, so by the time I noticed its existence, I had already stopped using Calm and switched back to Headspace. I’d imagine that the audio guides for stretching can work quite well, although video lessons would be easier to follow. Calm Masterclasses are like narrowed-down, audio-only versions of the MasterClass video courses online. They cover wide variety of mindfulness-related topics such as conscious parenting and social media addiction. 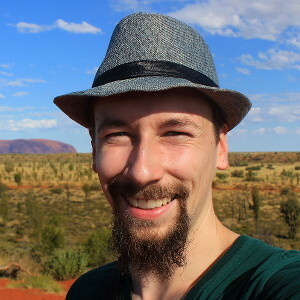 I listened through one of the courses (Breaking Bad Habits) and thought that it was pretty good, although it didn’t delve very far into its topic. I didn’t listen to the other Masterclasses as their topics didn’t feel relevant to me. Calm offers tons of different features, but that’s also where the app’s greatest weakness lies. Instead of digging very deep into anything, Calm seems to scratch the surface all over the place. For example, if you actually go through the meditation courses every day, you’ll run out of new courses within a few months. Once you’re done with the courses, you can either repeat the same single sessions or stick with the Daily Calm. And while the Daily Calm sessions are just fine, they don’t give you a chance to progress into longer or deeper meditation sessions. Although I continued to use Calm for a full year, my interest waned as months passed. Some might have issues with the overall feel of Calm. Calm feels like an app designed by a huge marketing department, not someone who’s really into the spirit of mindfulness. (Advertising their own Calm Sleep Scent within the app didn’t really help reduce the commercial and superficial impression.) Many others might love this approach, but I personally didn’t find it very compelling. On a positive note, doing their market research means that Calm knows what their audience wants – and is willing to offer more of it. I might not care about the (occasionally misattributed) inspirational quotes at the end of each Daily Calm, but I’m sure there are thousands of people who think otherwise. Calm knows how to do their marketing. In March 2019, electronic artist Moby pre-released his new ambient album exclusively on Calm. I used Calm meditation app every day for a full year. So, it’s best to finish this Calm mindfulness app review with the most important question: did it work? Well, yes. At least a little bit. I think. I had already done lots of meditation beforehand, and Calm didn’t do much to strengthen my practice. In fact, it may have done the opposite as I switched from 15-minute Headspace meditation sessions and 30-day courses to simpler 10-minute Daily Calm sessions. However, I found more depth in some of the single meditation sessions hidden within the clumsy navigation. I enjoyed doing longer meditation sessions on Loving-Kindness, gratefulness, relaxation before sleep and tons of other subjects. To me, Calm seems more inspirational than practical. Still, the mindfulness app is not without its merits, and I can imagine many people enjoying it. Calm offers a very approachable mindfulness platform for newcomers. After that, it’s up to the users if they want to deepen their practice elsewhere or stick with everything that Calm offers.